(USDA Claims Pesticide Residues in Food is Safe – Here’s Why They’re Wrong, by Dr. Mercola) Research has demonstrated that pesticides and other agricultural chemicals are neurotoxic, capable of damaging your nervous system. According to the US Environmental Protection Agency (EPA), 60 percent of herbicides, 90 percent of fungicides, and 30 percent of insecticides are also carcinogenic. All of these toxins are permitted on conventional farms, and any number of them can end up on your plate when you [eat] conventionally-grown fruits and vegetables. The increased use of genetically engineered plants and soil insecticides also increases the chemical load in food—particularly processed foods. The answer, of course, is to limit your exposure as much as possible, giving your body a chance to eliminate the toxins you do inadvertently ingest. Certain foods, such as fermented foods, can also help detoxify some of these chemicals. Yet despite all the known risks, the US Department of Agriculture (USDA) insists pesticide residues on food are no cause for concern. Meanwhile, one of the most recent studies investigating the effect glyphosate on Americans’ health noted that glyphosate interferes with many metabolic processes in both plants and animals. Just last year, new research implicated DDT in the development of Alzheimer’s, decades after exposure, and there’s no doubt in my mind that we’re heading down the same road with glyphosate. Dr. Seneff’s groundbreaking research published in June 2013 suggests that glyphosate may actually be the most important factor in the development of a wide variety of chronic diseases, specifically because your gut bacteria are a key component of glyphosate’s mechanism of harm. Dr. Huber has also presented evidence linking glyphosate to Bee Colony Collapse Disorder (CCD), and honeybee starvation. Glyphosate has also been found to be highly toxic to the soil surrounding a plant’s roots (known as the rhizosphere), woodland plants, amphibians, fish, aquatic environments, and mammals–causing reproductive problems and disrupting the endocrine system. Many leading authorities like Dr. Huber and Dr. Stephanie Seneff have started bringing attention to the practice of desiccation—a practice in which glyphosate is applied to the grain shortly prior to harvesting. Interestingly enough, this causes the grain to release more seeds. The Washington Blog recently ran an article giving an excellent overview of the process. Desiccating non-organic wheat crops with glyphosate began about 15 years ago. Glyphosate desiccation is also done on barley, beans, peas, peanuts, sugar cane, oats, canola, flax, and lentils, just to name a few. Roundup (glyphosate) is used as a desiccant at harvest on about 160 conventional crops. Needless to say, desiccated crops tend to be more contaminated with glyphosate. A large percentage of processed foods are made with wheat, and the practice of desiccating wheat with glyphosate appears to be strongly correlated with the rapid rise in celiac disease. Dr. Seneff’s research shows that glyphosate destroys the villi in your gut, which reduces your ability to absorb vitamins and minerals. Recent research has also shown that there are significant compositional differences between genetically engineered (GE) soybeans and non-GE varieties, and that glyphosate readily accumulates in the former. Contrary to industry claims, the study also found that they differ in terms of nutritional quality, with organic soybeans having the healthiest nutritional profile. All of this points to the importance of testing for and restricting glyphosate residues in food, yet that is NOT being done, ostensibly due to cost. It also brings up another important point, which is that despite rapidly rising concerns about safety, in 2013 the EPA quietly went ahead and raised the allowable levels of glyphosate in food—and by significant amounts to boot. Allowable levels in oilseed crops such as soy were doubled, from 20 ppm to 40 ppm. So all of a sudden, that makes “extreme levels” appear to be on the lower end of the allowable spectrum! It also raised the levels of permissible glyphosate contamination in other foods—many of which were raised to 15-25 times previous levels! Farmers are also ramping up their usage of the chemical due to the proliferation of glyphosate-resistant weeds. It’s worth noting that, for years, pro-GMO advocates claimed that genetic engineering would lead to reduced reliance on toxic agricultural chemicals. Now, the data shows us the exact converse has happened. A third issue that is completely ignored by the USDA when they claim pesticide residues in food are within safe levels is the fact that “inert” ingredients in herbicidal formulations are not necessarily inactive. On the contrary, synergistic effects between active and so-called inactive ingredients are a hidden source of toxicity that is widely overlooked. As discussed in a 2006 paper published in the Journal of Environmental Health Perspectives, it’s important to realize that the term “inert ingredient” does NOT mean that it is biologically or toxicologically harmless. When you see “inert” or “inactive ingredients” listed on the label of a pesticide or herbicide, it only means that those ingredients will not harm pests or weeds. This is how federal law classifies “inert” pesticide ingredients. And while a chemical may not kill a pest or weed, it may have a profound impact on human biology. “Here we demonstrate that all formulations are more toxic than glyphosate, and we separated experimentally three groups of formulations differentially toxic according to their concentrations in ethoxylated adjuvants. Among them, POE-15 clearly appears to be the most toxic principle against human cells… It begins to be active with negative dose-dependent effects on cellular respiration and membrane integrity between 1 and 3ppm, at environmental/occupational doses. We demonstrate in addition that POE-15 induces necrosis when its first micellization process occurs, by contrast to glyphosate which is known to promote endocrine disrupting effects after entering cells. Perhaps most disturbing of all, the researchers claim that cell damage and even cell death can occur at the residual levels found on Roundup-treated crops, as well as lawns and gardens where Roundup is applied for weed control. They also suspect that Roundup might interfere with hormone production, possibly leading to abnormal fetal development, low birth weights, or miscarriages. 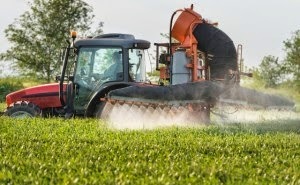 The monitoring of pesticide residue by the FDA and USDA received harsh criticism in a recent report created by the General Accounting Office (GAO). In its report, titled: “Food Safety––FDA and USDA Should Strengthen Pesticide Residue Monitoring Programs and Further Disclose Limitations,” the GAO suggests a number of major changes to the two agencies’ pesticide monitoring programs. Greater sample sizes are needed, the report says, and special attention should be paid to pesticides that already have established EPA tolerance levels, rather than those that do not. The GAO also calls for greater transparency in annual test reports. * The FDA does not test foods for many pesticides that have strict residue limits set by the EPA. * This lack of testing, according to the GAO, should be stated in the FDA’s annual reports. Ideally, you’d be best off opting for products bearing the USDA 100% organic label when buying processed foods in order to avoid exposure to agricultural chemicals, which certainly are not limited to Roundup. Don’t make the mistake of confusing the “natural” label with organic standards however. The “natural” label is not based on any standards and is frequently misused by sellers of GE products. Growers and manufacturers of organic products bearing the USDA seal, on the other hand, have to meet the strictest standards of any of the currently available organic labels. That said, my personal recommendation is to forgo processed fare altogether. Instead, pick up a good cookbook, and start cooking from scratch using whole organic ingredients. This really is the key to optimal health. Meats need to be grass-fed or pastured to make sure the animals were not fed GE corn or soy feed. You’d also be wise to stop using Roundup around your home, where children and pets can come into contact with it simply by walking across the area. Here are some great resources to obtain wholesome organic food. Eating locally produced organic food will not only support your family’s health, it will also protect the environment from harmful chemical pollutants and the inadvertent spread of genetically engineered seeds and chemical-resistant weeds and pests. * Farmers’ Markets — A national listing of farmers’ markets. * Local Harvest — This Web site will help you find farmers’ markets, family farms, and other sources of sustainably grown food in your area where you can buy produce, grass-fed meats, and many other goodies. * Eat Well Guide: Wholesome Food from Healthy Animals — The Eat Well Guide is a free online directory of sustainably raised meat, poultry, dairy, and eggs from farms, stores, restaurants, inns, and hotels, and online outlets in the United States and Canada. * Community Involved in Sustaining Agriculture (CISA) — CISA is dedicated to sustaining agriculture and promoting the products of small farms. * FoodRoutes — The FoodRoutes “Find Good Food” map can help you connect with local farmers to find the freshest, tastiest food possible. On their interactive map, you can find a listing for local farmers, CSA’s, and markets near you….